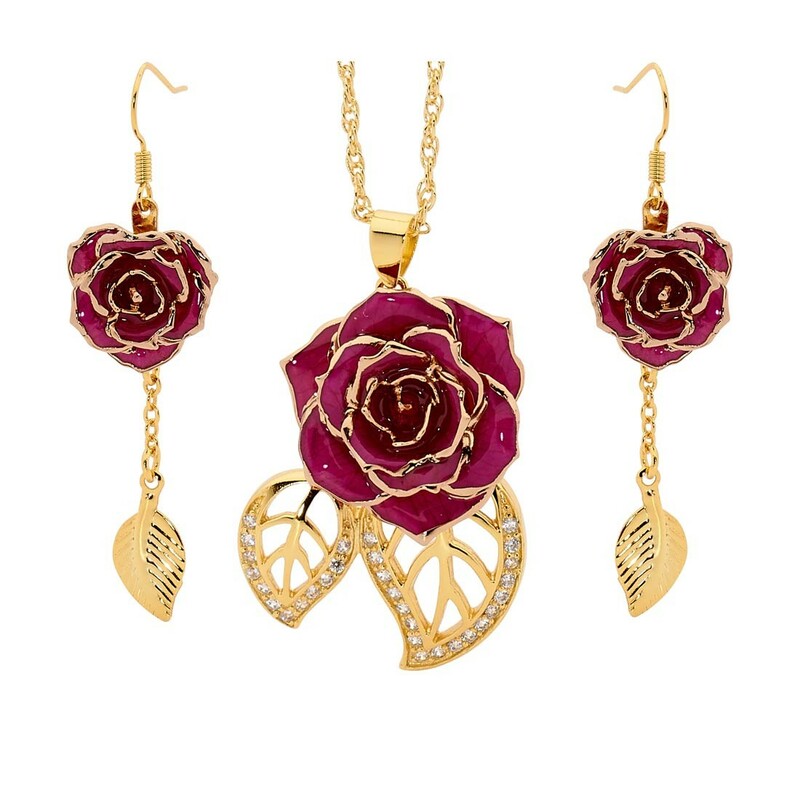 • A stunning set that twins an elegant purple pendant and earrings set with a lustrous 24 karat gold-dipped genuine rose. • Encrusted with 30 radiant synthetic diamonds and featuring our classic leaf theme, this pendant is incredibly stylish. 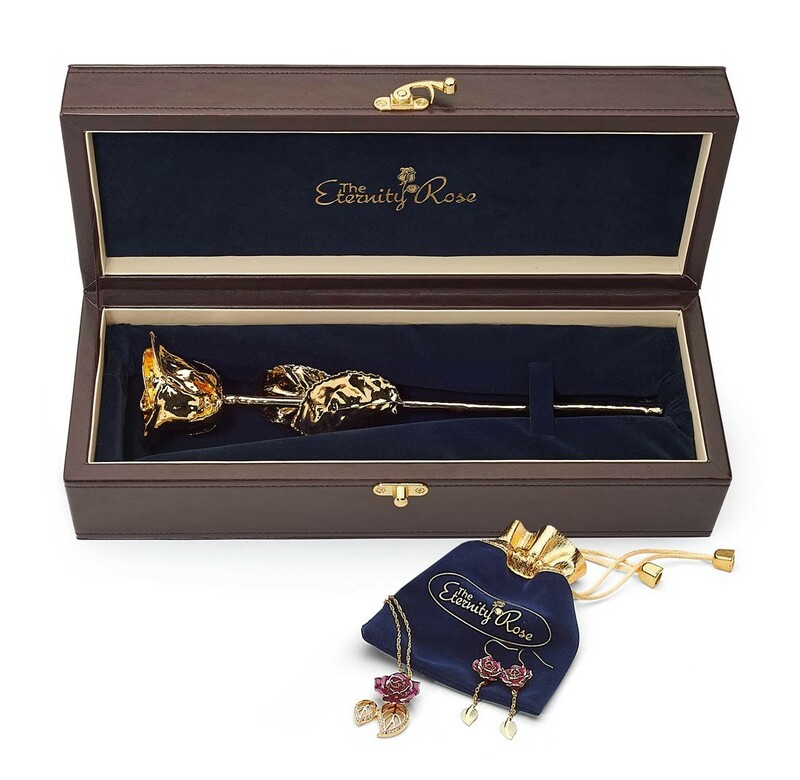 • Every purchase includes a stylish leather display box for the rose together with a sleek velvet pouch to contain the jewellery. • A lifetime guarantee protects these products' intricate detailing. 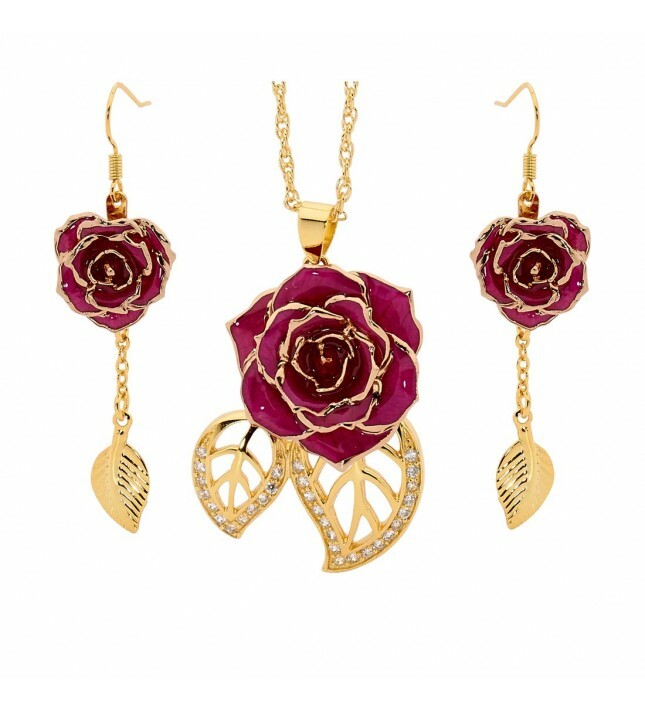 • A certificate of authenticity comes with the necklace, earrings and rose. • Express transport is provided free of charge and processing is extremely rapid. 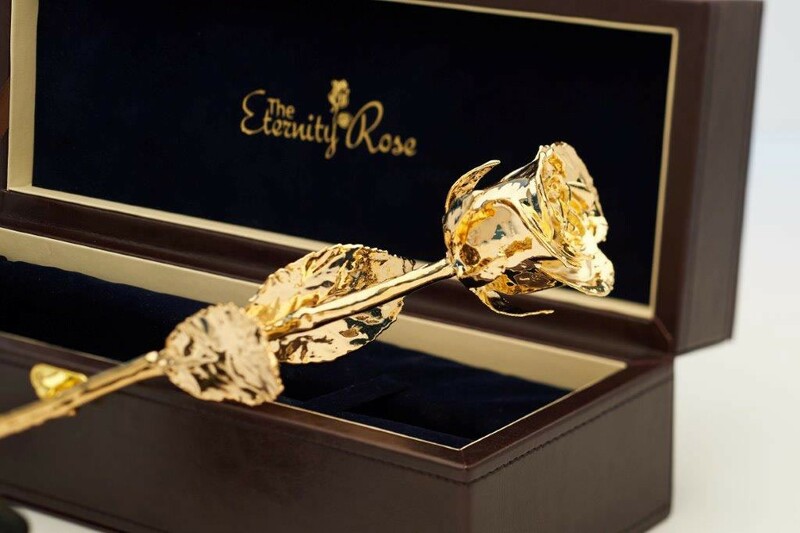 A beautiful genuine rose, handpicked at its point of perfection and then dipped in pure 24 karat gold. It measures approximately 11.5". 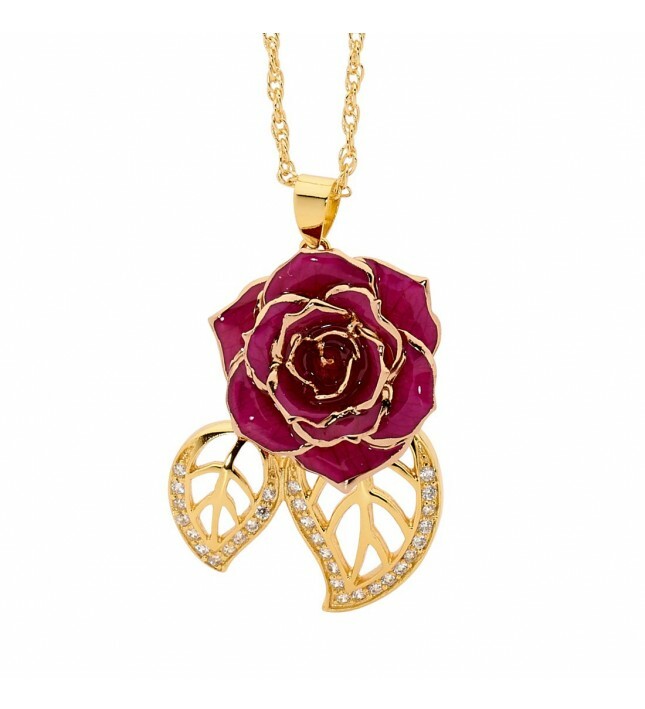 A beautiful pendant fashioned from real purple miniature rose petals that have been intricately glazed and trimmed with pure 24 karat gold. 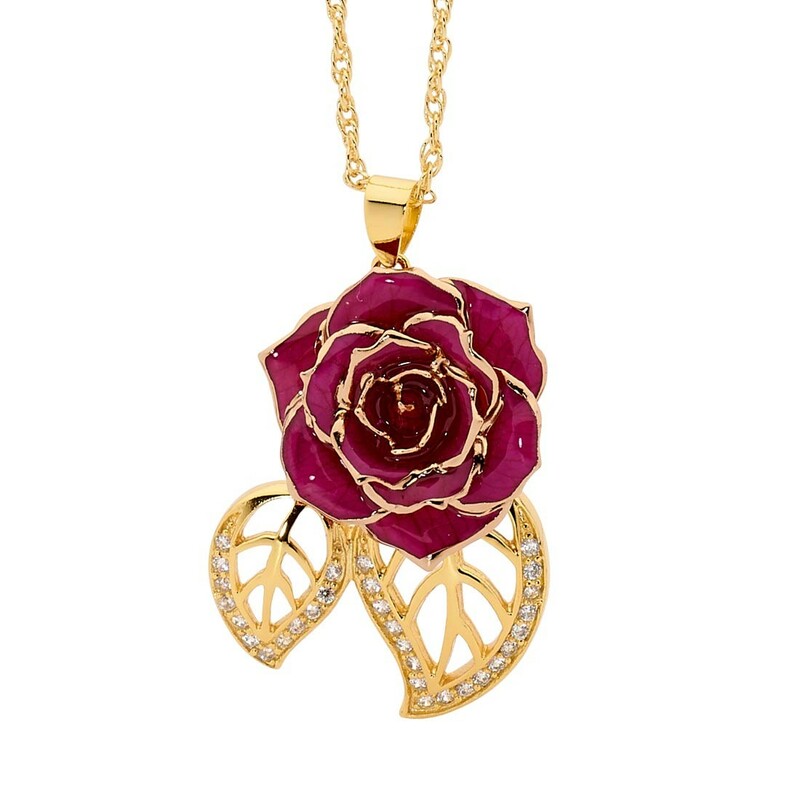 The mini rose head measures 3/4" across, and the pendant also features two 24 karat gold-dipped leaf figurines. The figurines feature synthetic diamond detailing for an ultra-glamorous look. A matching gold-dipped chain is also supplied. A set of drop earrings, each measuring 1 1/4" and featuring a purple miniature rose head which has been glazed and edged with pure 24 karat gold. There is also an attached gold leaf-shaped figurine for added elegance. The gold-dipped rose comes complete with a stylish leather presentation case while the earrings and pendant are supplied with a sleek dark-blue velvet pouch that features gold braided drawstring detailing to securely store the jewellery items. 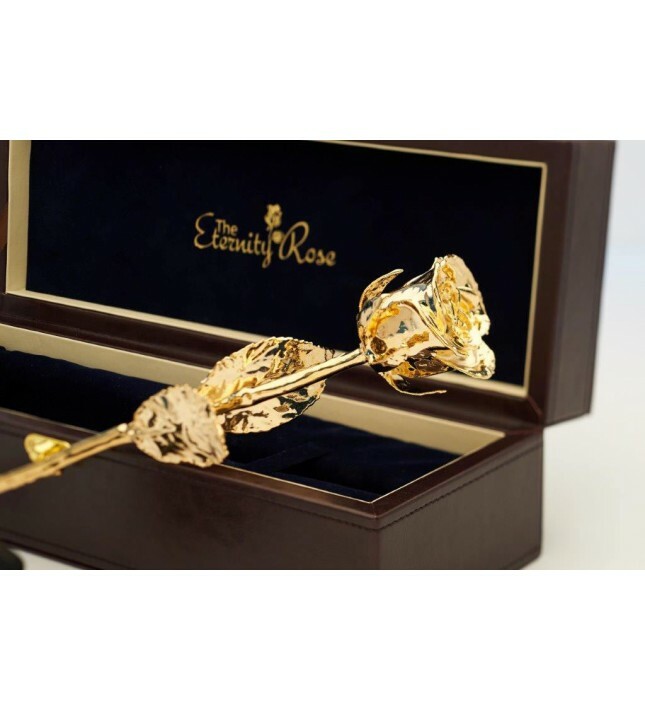 The Eternity Rose range has received awards for the design and high quality of its product range, and every item is produced only to the highest European standards. Every unique piece is an exclusive work of art. The items in this set have all been produced over a three-month period during which skilled craftsmen craft each piece by hand into a perfect and stunning work of art. 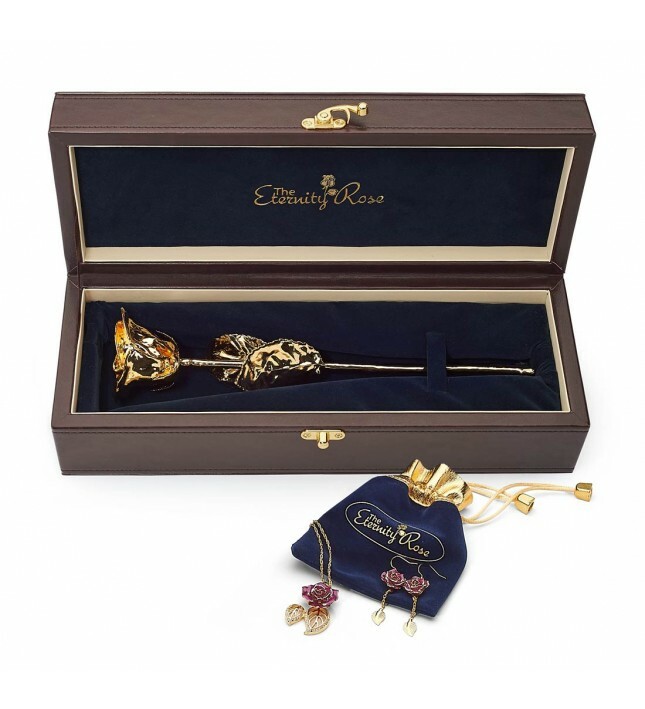 Ideal as a gift for any lady who loves art, jewellery, roses and the finer things in life, she is sure to appreciate the long-lasting and magnificent gift of an Eternity Rose set.